This Bank Holiday Weekend (24th May - 26th May 2014) we are running a May Promotion offering Extra Discounts for orders placed online - this includes orders for all types of doors and ironmongery. So if you were planning to purchase readymade doors and/or ironmongery in the near future, there is no better time to buy them than during this Bank Holiday Weekend! 1. 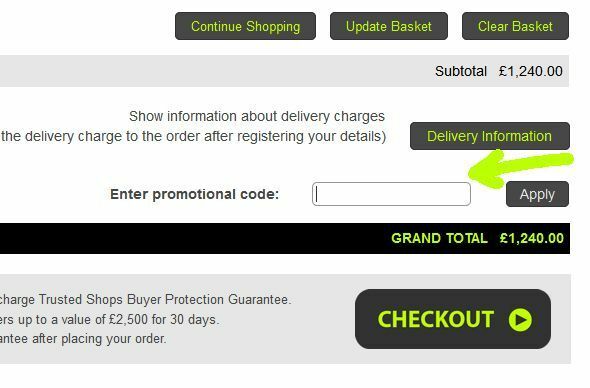 Total order value is a sum of all products in the shopping basket, excluding any delivery charges. 2. Vouchers are limited to one use per customer. 3. Vouchers will only work between 24th and 26th May 2014. 4. Minimum order value required is £500 for 5% and £1000 for 10% (including VAT, excluding delivery). 1. Add all products you intend to purchase to the basket (please make sure your browser accepts cookies). 2. Enter voucher code into the box, as shown on the image below. 3. You should see the voucher code and discount applied to the subtotal. 4. Proceed to the checkout stages.